Dipping Dippy Bird is a fascinating toy which has been around for long time and continues to fascinate. 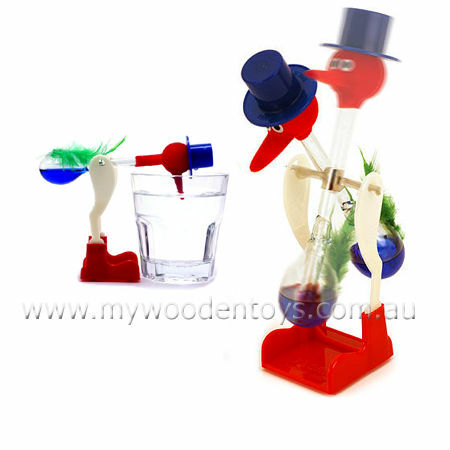 All you need to do is get Dippy Bird's beak wet in a glass of water and then let him rock back and forth. Every now and then he will dip all the way into the water and then go back to rocking again. When water evaporates from the felt on the Dippy Bird's head, the head gets cool. The decreasing temp in the head condenses the methylene chloride vapor (the coloured liquid inside) decreasing the vapor pressure in the head relative to the vapor pressure in the abdomen. The greater vapor pressure in the abdomen forces fluid up through the neck and into the head. As fluid enters the head, it makes the Dippy Bird top-heavy. The bird tips. Liquid travels to the head. The bottom of the tube is no longer submerged in liquid. Vapor bubbles travel through the tube and into the head. Liquid drains from the head, displaced by the bubbles. Fluid drains back into the abdomen, making the bird bottom-heavy. The bird tips back up. Size: Dippy is 18cm tall. We like this because: "A classic"